The following is culled from an autobiography written by the Awujale of Ijebu Kingdom, Sikiru Kayode Adetona, detailing the personality of former President Olusegun Obasanjo that most Nigerians did not have the opportunity to see. "The EFCC in Lagos had come calling brusquely on Mike Adenuga (Jnr), Chairman Globacom on 9 July 2006. They broke his gate, swarmed into his house and kept him under ‘arrest’. When I heard about the arrest, I called the legal firms, of Ayanlaja SAN & Adesanya SAN as well as Professor Biodun Adesanya SAN to take up the matter and secure Mike’s release. They swung into action and gave indication that they would take the matter to court. a. That Abubakar Atiku, the Vice-President, gave Mike Adenuga money from the Petroleum Technology Development Fund (PTDF) which were invested in Mike’s bank, Equatorial Trust Bank (ETB), and that the funds were used in paying for the Globacom licence. b. That as a result of the connection in (a) Atiku was a major shareholder in Globacom. And Atiku used his clout to ensure that PTDF money got into ETB. c. That General Ibrahim Babangida, the former Head of State, was also a major shareholder in Globacom. It was not enough for Mike to merely present his case to EFCC, for it seemed the EFCC was under some remote control. The Presidency was after Atiku. Atiku at some point was the Chairman of the PTDF; an attempt was being made to indict him for alleged illegal and unauthorized channelling of PTDF money into Globacom. All sorts of rumours were flying around and the Presidency wanted to pin down the case against Atiku. If Ibrahim Babangida also fell into the trap, so much the better. A wide opening presented itself and EFCC seized it. G.Subair is Mike’s second cousin. His father died young and he grew up, just as I did in my early life, living with Mike’s mother. He worked for Mike and was seconded, amongst other things, to open the Kaduna office for Globacom. In need of accommodation or office space, he leased, on behalf of Globacom, a house, at 2-3 Dawaki Road in Kaduna belonging to Mohammed Badamasi Babangida and used that address in official correspondence and memoranda. Mohammed is the first son of President Ibrahim Babangida. This was Babangida connection to which EFCC hung on when they were rummaging through Globacom documents. This was, according to them, irrefutable evidence that Babangida was a major shareholder in Globacom and that his son, Mohammed Babangida, or G.Subair or Mike was fronting for Babangida in this venture. Mike told me how he had raised money through the BNP Paribas Bank in France and how he paid to New York for the Globacom licensing fees. All the money involved could be traced with supporting documents to France and New York in the form of a huge loan. The Bank BNP Paribas on its part had a letter stating clearly their involvement in the transaction and Mike wanted to present this among other documents to President Obasanjo. I called Obasanjo and relayed the facts as I had them from Mike to him. I requested for his fax number so that I could fax Mike’s letter explaining all the transactions and the Bank of Paribas letter to him. As soon as he gave me the fax number, I faxed the documents to him. Still, Obasanjo was not satisfied. It seemed that it was all a ruse because they were really after Atiku and Babangida and wanted Mike to implicate them. Mike refused to cooperate. If he was not going to cooperate, they thought, harassment would do it. On 19 August 2006, I made a statement to the press asking Obasanjo to caution Nuhu Ribadu, the head of the EFCC, about his mode of operations. I denounced the harassment of citizens by EFCC and urged them to go to court if they had anything concrete against anyone. While Mike was in exile, we shared a moment of relaxation together. We took a holiday together in south of France with some members of our families. I had with me my wife Olori Kemi, my daughter, Ronke and Oba Adekoya, the Dagburewe of Idowa. Mike came along with his two daughters and his niece. While on this holiday, the President of France, Jacques Chirac, was going to be holding a conference with African Heads of State in Nice. Coincidentally, we got to know that Obasanjo was booked to stay in the same hotel where we were staying. Later, we learnt he had changed his mind and would not be attending the conference. Then not long afterwards, we were told he had decided to attend after all. By the time he finally decided to attend, all the rooms in the hotel were fully booked and he was now booked into another, Embassy Hotel, which was a stone’s throw from when we were. I got to know that he would check in at 8.00am on the day of the conference. At 8.330am, I went to his hotel and took Mike along with me. From the reception, I spoke to him on the phone. When he asked from where I was speaking, I told him I was downstairs in the lobby of his hotel! He said he would send someone down immediately to lead me up to his suite, and he did so. I left Mike behind in the hotel lobby. When I got to his suite, there were already a number of people in the corridor, in his living room and the dining room waiting to see him. His ADC took me straight to see him in his bedroom. I had hardly settled down when he started talking to me about his deputy, Abubakar Atiku. He was at daggers drawn with Atiku. When he exhausted all he had to say about Atiku, he jumped on Theophilus Danjuma, his estranged friend. They fell out after Danjuma had served him as Minister of Defence. I sat there just listening. He needed to get a lot off his chest. He told me how would leave the Chirac conference immediately after the opening because he wanted to attend a PDP campaign in Gombe at 5.00pm that same day. He was lead campaigner for the PDP and Umaru Yar’adua for President. He reeled off a number of events where he was going to be engaged in the coming months, including the opening of the Obajana Cement Factory. Wait a minute! Something struck me at the mention of Obajana Cement Factory.I told him that I had heard that he and Aliko Dangote jointly owned the cement factory. I told him that I heard Dangote was fronting for him in the venture. His reply was to query whether I believed what I heard. I countered by saying whether I believed it or not was irrelevant to the question that I had asked him. He said nothing further on this. Before we left his room, I pointed out to him that now that he was approaching the end of his term in office, there were some people to whom he owed apologies: Chief S.O. Bakare (Oluwalogbon) was one. Chief Bakare gave everything to support Obasanjo when he was down. In spite of Obasanjo’s condemnation by the populace, Bakare still stood by him. I had forewarned Bakare that Obasanjo would eventually dump him. Notwithstanding, he stood by Obasanjo. In the end Obasanjo walked away. A few months in office they separated as friends. I told Obasanjo that Mike Adenuga was in Cannes and that I had brought him with me. He was waiting in the foyer downstairs. I told him that the reason I brought Mike along was that it was not unlikely that Obasanjo would hear that Mike was in Cannes while he was in town and would deem it discourteous if Mike did not show up to pay his respect. Now that I had told him, that Mike was downstairs, it was now up to him, if he wanted to see Mike, to send someone to bring him up. Obasanjo objected to Mike coming to see him in his suite. Instead, he said he would see Mike downstairs on his way to the conference. At this point, I volunteered to go downstairs and wait with Mike. Obasanjo again objected, insisting that he and I should go down together. Soon after, his ADC came into the room to remind him about the time. He went into his bathroom, got ready and we went to the lift with his Foreign Minister. When we got down, Mike came forward to greet him. ‘I have nothing against you, it is a matter of principle’ Obasanjo told Mike. Mike in turn said, ‘Your Excellency, I understand. Thank you.’ That was all the exchange they had. When Obasanjo left office in 2007, we met at the 90th birthday ceremony for Chief T.O.S Benson in Lagos on 23 July 2007. As a matter of fact, we sat side by side. In the course of our conversation, I told him I was going to be in Abeokuta the following day. He said he would be in Ota when I was there, but that he would specifically come to Abeokuta to host me for lunch. He kept his word. So much so that he called me on the phone when lunch was ready! I assured him that I would not miss lunch and I would be with him as soon as I was through with my meeting. I went as promised for lunch with Oba Adekoya, the Dagburewa of Idowa. When we got there, Obasanjo also had Alhaji Ola Yusuf from Owu, Abeokuta, who had come to see him and he too joined us for lunch. We were four at table. It was sumptuous lunch, and I had never been treated to anything like it in our long relationship. Mike Adenuga was still in exile abroad and Obasanjo steered the lunch talk in his direction. He asked me to ask my son meaning Mike Adenuga, to return home. I requested that he should leave the matter until after lunch and it would be tackled on a one-to-one basis between us. He agreed. After lunch, we went into his private sitting room. I declared that what Nuhu Ribadu, Chairman of EFCC, was doing in respect of Mike Adenuga was wrong and he was doing it at Obasanjo’s behest. I told him that I refrained from interfering because I wanted to see how the law would pan out on the issue. The kernel of the matter really, as I told him, was his disagreement with Abubakar Atiku, his deputy, and they had taken the matter almost life-and –death level. Mike Adenuga was a pawn in the crisis and he should be given the right to defend himself. I reminded Obasanjo that he was no longer in office and he should back off in his pursuit of Mike. I went further to let him know that if Nuhu Ribadu did not desist from molesting Mike, I would go into the ring with them. Here I made clear that I would take him and Ribadu to unnecessarily and unjustifiably pursue Mike. Obasanjo promised to see Ribadu and to ask him to back off. He further promised to give me a feedback on this. When I did not get his feedback, I called him a number of times, but the phone would ring and not be answered. Eventually, I called his aide, Bodunde Adeyanju, who on picking my call passed the phone to Obasanjo to speak to me. Obasanjo told me Ribadu was out of the country and he would get back again to me on Ribadu’s return. I told Obasanjo how difficult it had been to reach him on the phone. I offered a solution. I would ask Mike to send him a phone which he would give his aide, Bodunde, as an intermediary. This way, all I had to do was call that number and Bodunde would pass it to him if he wanted to speak to me. He agreed and Mike sent the phone down the next day. But still Obasanjo did not come back to me on the issue. Mike remained in exile in London and nothing much was heard again or raised by the EFCC about him. Later in 2007, I called Mike in London and told him I wanted to know why he had refused to return home. Since he had no skeleton in his cupboard, then he should return home. I explained to him that the purpose of the wealth with which he had been divinely endowed was to care for his needs, and his interests. It was also for use to defend his honour and integrity. For these reasons, I urged him to return home. Thereafter, Mike returned home. Nobody touched him and no institution has prosecuted him because there was no genuine reason from the onset for anybody to touch him. However, the construction project at Bells University slowed considerably while Mike was in exile and a few solicitous calls from Obasanjo to Mike while he was in exile did not change the pace of work. On his return from exile, the school Bells University had the temerity to write to him seeking for a meeting to discuss the continuation of the project. When I got to know, I offered to be in attendance at the meeting and sent word round that I would be in attendance. I had the intention to lambast all of them. They must have sensed it because up till now, the meeting has not been held! 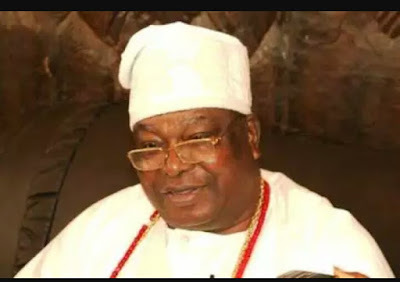 ‘Awujale: The Autobiography of Alaiyeluwa Oba S.K Adetona.